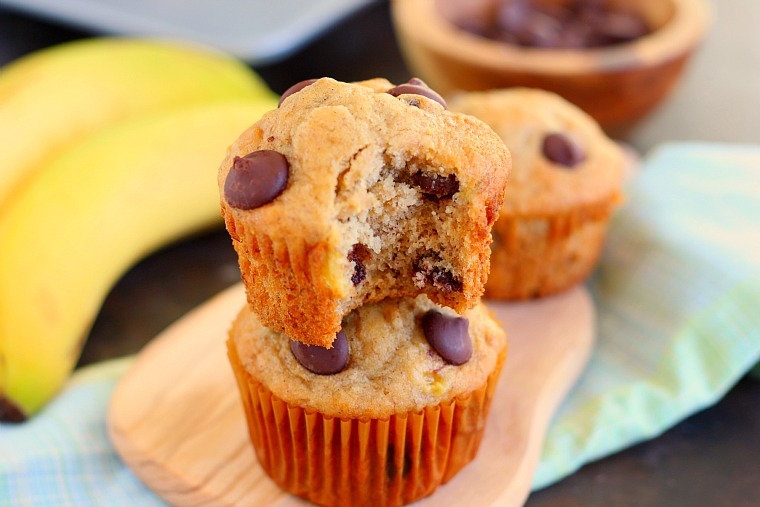 These Banana Chocolate Chip Muffins are jam-packed with sweet bananas and dark chocolate chips. 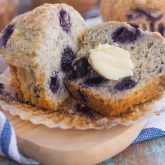 The Greek yogurt keeps these muffins on the lighter side, while packing a punch of protein, which makes these muffins soft, moist, and flavorful! I’m just going to get it out there…how is it possible that it’s already 2016? I swear we just celebrated the start of last year, and now here we are, a year later. Oh well, such is life, right? I hope you all had a fantastic holiday season and are ready to start the new year off with a bang! I’m not one to make resolutions, as my good intentions usually end up going nowhere. Instead, I like to make goals, which I feel is more realistic for me. And if I set my mind to something, it’s almost a guarantee that it will get done. Setting goals (and achieving them) are a big part of my life. 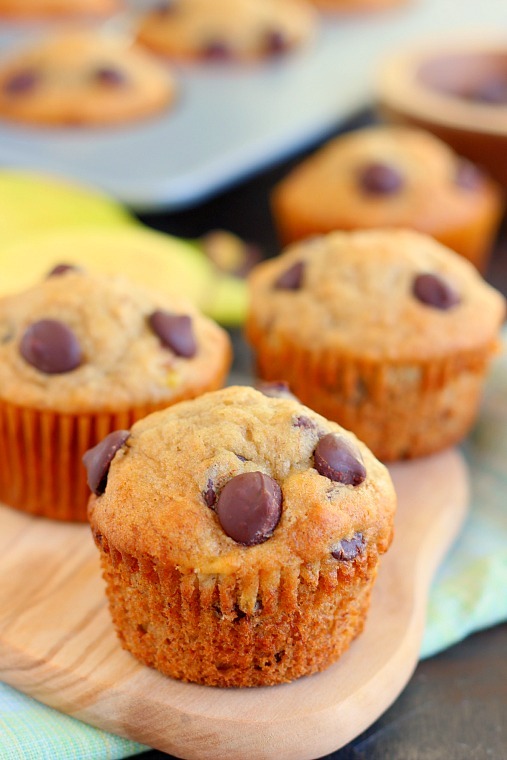 And my goal for you is to incorporate these Banana Chocolate Chip Muffins into your life. I’m not going to shove a healthy treat or salad into your face today, as I’m certainly not a health food blogger. And while I do like to watch what I eat, and occasionally I will share a healthy recipe on here, I’m not all about that. So unlike other skinny recipes or low-fat treats that you’ll stumble upon today, these Banana Chocolate Chip Muffins are sweet, delicious, and not the most calorie-friendly muffin out there. But, they’re not the worst, either, since they’re lightened with Greek yogurt. How about that for the first Monday in January? Banana is the name of my game and I love devouring and baking with them. From breakfast dishes to sweet treats, banana-anything is a winner in my book. And if you’ve been hanging around here long enough, you’ll remember that I almost always have a few ripe bananas lying around the kitchen, as the hubster (who eats a banana almost every day) doesn’t like when the brown spots start showing. So that’s when I step in and grab those bananas for baking. I love sneaking Greek yogurt into baked goods whenever I can, so when I had the idea to whip up these muffins, I knew I would add in some yogurt. Not only does it add a touch of protein, but it also makes these muffins extra soft and moist. And that’s a must for me! These Banana Chocolate Chip Muffins are perfect for a breakfast, dessert, or as a mid-morning snack. The combination of the sweet bananas and dark chocolate are a match made in heaven. It’s like eating banana bread, in muffin form, and drizzled with chocolate. Mmm mmm good! And the best part is that these muffins can be prepped and ready in no time! Simply mix together your dry ingredients, followed by the wet ingredients, and then combine. Fold in the mashed bananas and dark chocolate chips, and spoon the batter into muffin tins. Within 20 minutes, these Banana Chocolate Chip Muffins are ready to be devoured. They taste delicious when right out of the oven, as the chocolate gets all melty and gooey. But whenever you devour these babies, I guarantee you’ll love the delicious taste as much as me. So the next time you have some ripe bananas lying around, why not whip up a batch of these Banana Chocolate Chip Muffins! Easy to make and full of flavor, you’ll love the decadent taste and soft texture. Looking for more muffin recipes? I’ve got you covered! Preheat oven to 425F. Line two 12 count muffin tins with paper liners or grease with non-stick cooking spray. Set aside. In a medium bowl, combine the flour, baking powder, baking soda, cinnamon and salt. Set aside. In a large bowl, cream together the butter, white sugar, and brown sugar until light and fluffy. Slowly beat in the egg, vanilla, and yogurt. Add the flour mixture and beat until just combined. Gently fold in the mashed banana, followed by the chocolate chips. Spoon batter into prepared tin, filling 3/4 full. Bake for 5 minutes at 425F, then keeping oven door closed, lower temp to 350F and bake for 15 minutes, or until muffins are lightly browned. This oven trick helps to ensure those large bakery-style muffins. Remove from oven and let cool for 10 minutes in pan, then remove and cool completely on a wire rack. Bananas and Greek yogurt make for the moistest, densest cake. I love that texture! These look like the best breakfast. All that protein! Thanks, Mir! These muffins definitely make a delicious breakfast or dessert! Banana muffins, hurray!! I am forever looking for ways to use up those last bananas, and I love the idea of the yogurt in the batter. Thank you, Kate! These muffins are the best way to make use of those overripe bananas! Thanks for the muffin love, Catherine! Yum, yum, yum! We're all about bananas around here, but my husband and boys don't really like them with the brown spots either. And muffins always taste better with chocolate, right? Total winner here! Happy New Year, Gayle! This is a breakfast I can get behind! Banana 'anything' is a favorite of mine...but combined with chocolate in muffin form is a real winner! Thank you, Annie! I'm a fan of anything with bananas, too! Thanks for the kind words and for stopping by, Summer! Happy New Year, Gayle! I'm not a resolution maker either, but I do set small (realistic) goals for myself. #GreatMinds I LOVE that you are posting these muffins!! I don't know whats been up with me lately, but I have been eating bananas like I'm part monkey. ;) So these muffins are totally screaming my name! LOVE the greek yogurt in here! Going to have to sub white chocolate for the chocolate chips because of my dang allergy, but I can't wait to make these! Pinned! Cheers, my dear! Tasty looking muffins. Anything with banana and chocolate chips is a winner in my book. I don't usually make New Year's resolutions, either, but since my birthday is next month, I've decided to try to get a bit healthier and lose weight by the time my birthday rolls around. Resolutions are hard for me to keep, but I guess I can try. Thank you for the kind words, Neeli! I agree, resolutions are hard, but if you really stick to it, I'm sure you can accomplish them! I know! I can't believe the new year is here!!! These muffins are perfection!!! they look delicious! love your calorie-friendly muffins!! Thank you for the muffin love, Alice! Happy New Year, Gayle! I hope it is off to a wonderful start! These muffins are certainly starting my year off right. Banana chocolate chip muffins made with Greek yogurt have to be the best thing ever! Thank you, Jen! I agree, greek yogurt and muffins with bananas and chocolate are definitely a great thing! Happy New Year to you, too! These look fantastic! We always have brown bananas in the freezer! Happy New Year, Gayle! I don't make resolutions either -- goals are where it's at for me, too! I've always got ripe bananas lying around and I love baking with them. These muffins look like one delicious way to wake up, and chocolate chips always make everything more tasty! Happy New Year, Gayle! I'm not much for resolutions either and I love that your post for the first Monday in January includes chocolate! Chocolate banana muffins sound like the perfect way to kick off 2016! This year definitely did fly by! Healthy treats that taste good are definitely the key to staying on track. Love these muffins!! They sound delicious and look awesome! Thanks for the muffin love, Lauren! banana muffins are the best! these look so perfect for snacking Gayle! Pinned! Thanks for the kind words and pin, Manali! Happy New Year, Gayle! 2015 definitely flew by! I'm hoping 2016 slows down just a little bit so I can take my time to savor these delicious muffins! 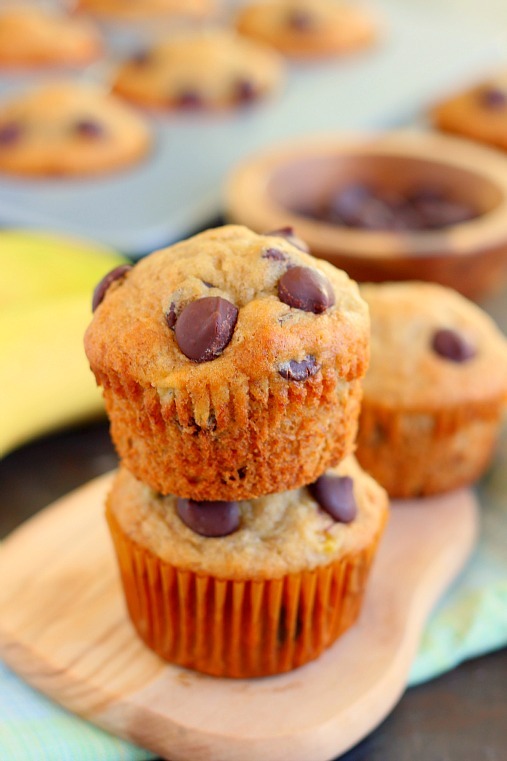 Banana muffins are the best and I love that you used Greek yogurt and dark chocolate chips! Thanks, Sues! I agree, muffins and coffee make the perfect pair! We are the worst at resolutions. We keep them to look at the following year, so at least we get a good laugh out of it :) Your muffins look so yummy! My boys like their bananas practically green, so I always have plenty of ripe bananas for baking. Haha that's a good idea, Sherri! I would definitely laugh at mine every year! :) Thanks for the muffin love! These look perfect Gayle! I haven't baked muffins in a long time, so I'll definitely try these! Pinned! Thanks, Mira! I hope you love these muffins if you try them! Next time, I won't have any braces, so I won't have that problem thankfully! 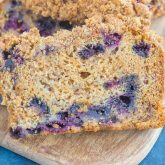 I swear by greek yogurt in lightened up baking; it always lends to a moist and fluffy texture! Im sure these muffins tastes as good as they look, banana and chocolate go perfectly together! Realistic goals are the way forward I think! Mmm, I love banana and chocolate together, and even better when they are in a muffin. These look awesome - indulgent enough to feel like a treat, but healthy enough to be breakfast. Awesome recipe! 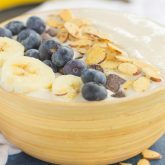 I'm always looking for new ways to use up ripe bananas! I wish I had one of these muffins for breakfast! Thanks, Jessica! Those ripe bananas would be perfect for these muffins! These muffins look like they have the perfect texture! Yum, yum! Who can resist a chocolate chip banana muffin? I buy bananas in bulk all the time just so I can make treats like this. Thanks for the muffin love, Brielle! 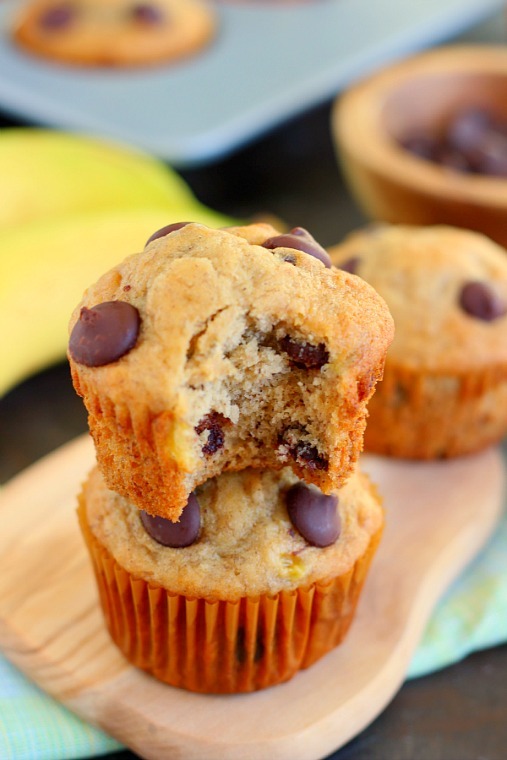 Chocolate chips and bananas are definitely hard to resist! These banana chocolate muffins look wonderful Gayle! I love banana and chocolate together so these muffins are perfect! I always have a bunch of overripe bananas at the end of each week and I'm always trying to find new ways to use them! These little muffins look so good and they have chocolate. What's not to love, right? ;) Hope you had a great New Year, Gayle! Thanks, Danielle! Chocolate makes everything better! :) Hope you had a great New Year, too! Omg Gayle we just moved and been eating out for almost a week now since we are still in moving, buying & packing mode! I so wish I had these for breakfast instead of those Starbucks muffins whose calories make me think if I should be working out 3 times a day hehe!! These look so moist too! Thank you, Ami! These are definitely butter than Starbucks, at least in my opinion! :) Hope your move went well and that you're getting settled in! Thank you for the kind words and for stopping by, Megha! These look delicious!! 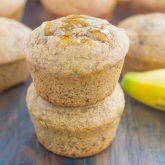 I love banana muffins, and love that you've made them a little lighter with greek yogurt! Now I need to make some! 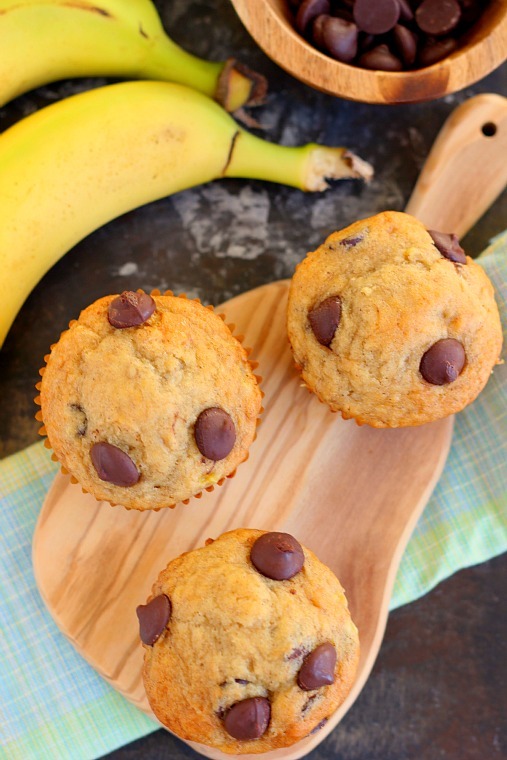 I can never get enough banana or chocolate, so these muffins are calling my name! Love that you added Greek yogurt to keep them soft and moist! Thanks for the muffin love, Rachel! Thank you for the kind words and for stopping by, Karrie! Happy New Year, Gayle! I am so bad at sticking to resolutions. I think I will try your approach with goals instead :D These muffins look wonderful, I am such a fan of Greek yogurt in baked goods. YUM! Goals are so much better! :) Thanks for the kind words, Denise! Yum!! I haven't baked with banana in so so long!! Love that you used the chocolate too :) Happy 2016!!! Thanks for the sweet comment and muffin love, Demeter!